Infrared Food Thermometers allow the user to measure the temperature of an object without the need to make physical contact with it. They work by measuring the wavelength of the heat produced by the object which is emitted in the form of infrared radiation invisible to the human eye. Infrared food thermometers are sometimes known as laser thermometers. This is due to the beam of light the device emits which allows the user to accurately highlight a precise area of the object being assessed. Infrared food Thermometers have been used in kitchens, in industrial settings and in public health scenarios to deliver accurate data quickly and hygienically. Comark Infrared food Thermometers are manufactured to the highest standards to generate reliable data quickly and efficiently. 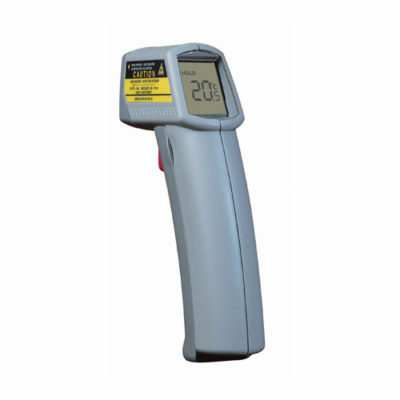 The KM814 Infrared HVAC Thermometer with Laser Sighting is a pocket-sized infrared thermometer which is ideally suited to general purpose HVAC applications. 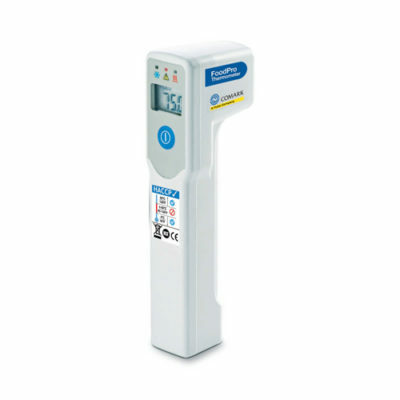 The KM814FS Infrared Food Thermometer with Laser Sighting is a pocket-sized infrared thermometer which is ideally suited to food industry HACCP requirements. There are many varieties of infrared thermometers capable of meeting the requirements of HVAC and food industry HACCP. 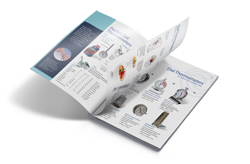 See the “More Info” data with each thermometer for their exact specifications including the temperature range, display resolution and emissivity characteristics. How Does an Infrared Food Thermometer Work? 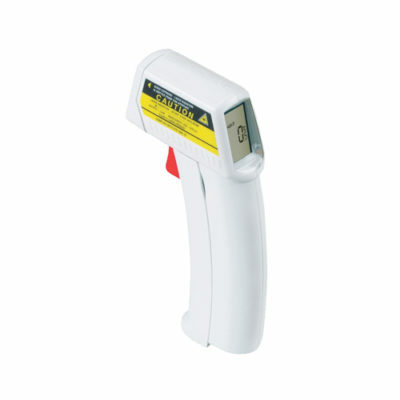 An infrared food thermometer measures the range of thermal radiation emitted by an object. This radiation, sometimes referred to as “black body” radiation. The wavelength of this light is longer than that which can be seen by the human eye. The longer the wavelength, the hotter the object being measured. Infrared food thermometers are sometimes known as laser thermometers or non-contact thermometers. The laser pointer you see when the infrared thermometer is in use is used to direct the thermometer rather than being integral to the sensor apparatus itself. In other words, the light you see is not part of the temperature reading apparatus but there to highlight exactly where, on the object being assessed, the reading is being taken. The detection itself involves an optical system which focuses the infrared radiation from the object being measured onto a lens. This light is converted to an electrical signal which is calibrated by the thermometer and presented as a temperature. Benefits of an Infrared Food Thermometer. 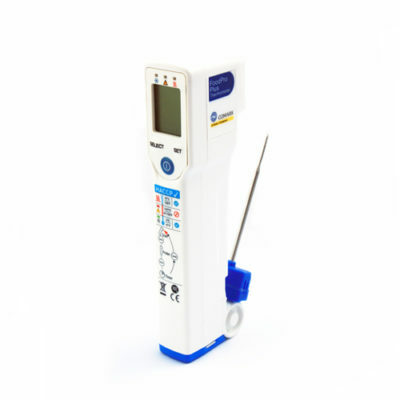 A non-contact infrared food thermometer is useful for measuring temperature under circumstances where thermocouples or other probe-type sensors cannot be used or do not produce accurate data for a variety of reasons. In food preparation environments, there are hygiene benefits of temperature monitoring devices that do not require physical contact. Most infrared food thermometers are suitable for portable use, fitting comfortably in a top pocket or wallet. The typical use method is to ensure the guide light is pointed at the spot where the temperature reading is to be taken, pressing the activate button then waiting a few seconds for the reading to normalize. The reading will be retained on the thermometer’s displays for a few seconds once the trigger is released allowing the temperature to be read by the user. A good infrared thermometer will be accurate to within 0.5 degrees Celsius and a temperature response time of 10 seconds or less. This method of temperature measurement is, when the device is used correctly, comparably accurate with more traditional thermometers. The thermometer can be calibrated via the crushed ice method shown here.